Sanya has released an official document to boost the city as an international yacht destination in China and the world, the Maritime Bureau announced Thursday. 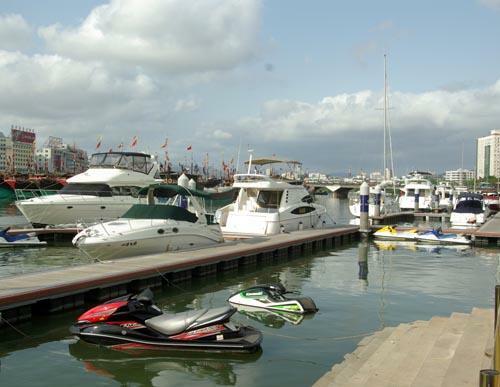 At present, there are more than 80 private yachts at the port and the number of yacht berths is expected to reach 1,000. Sanya Hongzhou International Yacht Club is the first port open for international yachts since construction of Hainan International Tourism Island rose to become a national strategy in 2010. Under its management, the club has a hotel offering 5-star services for its yacht memberships and an Entry and Exit Hall, the only one set up in Hainan, which has attracted the attention of 20 international yachts brands like Pershing, Sunseeker, Azimut-Benetti, Beneteau and Brunswick. Noting that Sanya enjoys great growth potential in terms of providing a clean sea area for the yacht industry, authorities say priorities will be given to developing a yacht marina and yacht maintenance center as well as providing further relaxed and more flexible policy on registration as well as port entry and exit. It will be part of the government’s aim to encourage more yacht companies to expand their presence in Sanya.